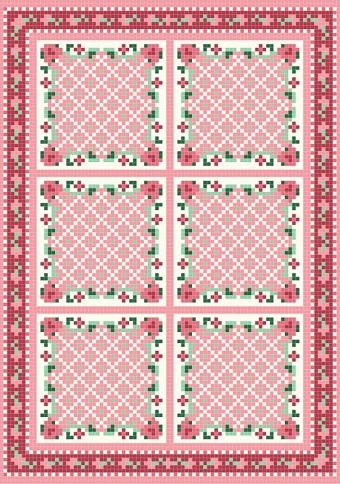 The Rose Garland Rug is 92 stitches x 131 stitches. It is charted using DMC floss colors. The approximate finished size stitched on 40 count silk gauze is 2 3/8" x 3 3/8". Stitch it on 60 count silk gauze for a quarter scale rug with the approximate finished size of 1 1/2" x 2 1/8". Purchaser will receive a link to download a PDF file with the chart and thread suggestions.